As I come to the end of my Majestic Colonial vacation, I am reminded by William Shakespeare, “Parting is such sweet sorrow. . .,” but not before I mention that I will definitely return to this all-inclusive hotel and resort. The Standard Room v. Why Pay More? 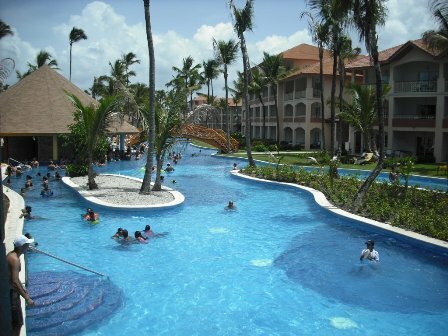 NOTE: A summer trip to the Majestic Colonial, Punta Cana, Dominican Republic, with airfare and an all-inclusive food, beverage and lodging package costs approximately a thousand dollars per person for a full week. 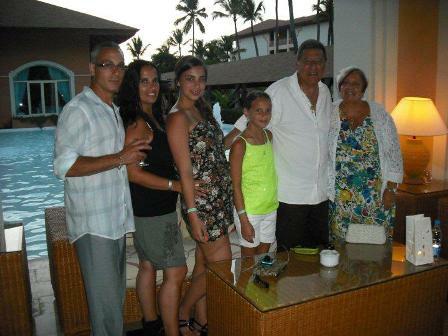 Our party left from Newark Airport nonstop into Punta Cana, approximately a three-and-a-half hour painless flight. My son selected the standard rooms for us, which were comfortable, roomy, had an extra convertible couch, and a large outside balcony with tables and chairs, full bath, shower and jacuzzi. Our room for two had a king size bed. The sight from our balconies were beautifully manicured gardens, with the pool right outside our building, winding down from the lobby to the beach. 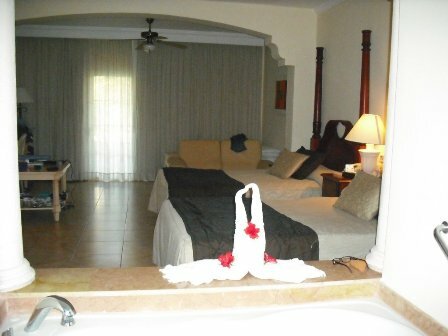 There are pool suites and ocean front suites if youwant to upgrade. There were lots of day activities around all of the pool areas, but the main pool, where the bar extends into the refreshing water, attracts the most guests. Water exercise, zumba lessons, card games, children’s games, and dance lessons are daily events. The beach is quieter, with lots of huts for shade and to cool one’s body. The ocean is a perfect temperature, and there are many water sports to entice the energetic. Japanese, French, Mexican, a Steak House, a Seafood Restaurant, and an Italian station at the main buffet (most are located off the lobby area) are easy to make reservations for. We never had one disappointing dinner. Of course this depends on everyone’s taste buds. We selected Tiano, the Mexican restaurant twice. The food is as spicy or as mild as you’d like with a great selection of Mexican standards. Also at Tiano, they have hot Dominican specialties to choose from around the salad bars, which are also part of the all-inclusive. There were no extra charges or costs for food or beverages at any time during our stay. It was sad to say goodbye to the Majestic Colonial on the last day. With all of the pictures for memories, we’ll relive this vacation for a long time to come. In fact, I think I hear plans are in the making for a next time. As I always say to my husband and friends, “I’m a vacation waiting to happen!” If you’d like more information about all-inclusive hotels and resorts send an email to Anthony Florio at antflo817@aol.com.